Spaghetti Squash can be made a number of different ways, but I've found this to be the easiest and you can season it whatever way you like. These directions call for a medium squash; you will have to add or subtract microwaving time if your squash is larger or smaller. Take one medium squash and cut in half. Scoop out the seeds (like a melon) and throw the seeds away. Place both halves on a microwave safe plate and place in the microwave. Cook for ten minutes on your regular high setting. When time is up, remove from the microwave. If you do not have a turntable in your microwave, turn your squash half way through the ten minutes. Use a hotpad to hold the squash half, as it will be hot, and test the inside with a fork. If it flakes away from the shell easily, it's done. If not, give it another two minutes. A medium sized squash shouldn't take longer than 12 minutes total. Use a fork or spoon to scrape the insides of the squash into a bowl. Throw the outer shell away. Now you can season any way you like. Good options for seasoning are tomato spaghetti sauce or olive oil with a dash of pesto. My favorite is simply with salt, pepper and butter. I use about a quarter stick of butter (2-3 tablespoons) for a medium size squash. 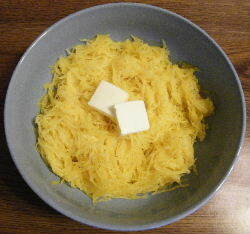 Click here for more great vegetable recipes like Spaghetti Squash!